Wineware Summer Competition: Win some great Wine Travel accessories! How would you like to win some fantastic Wine Travel Accessories in the Wineware Summer Competition?! 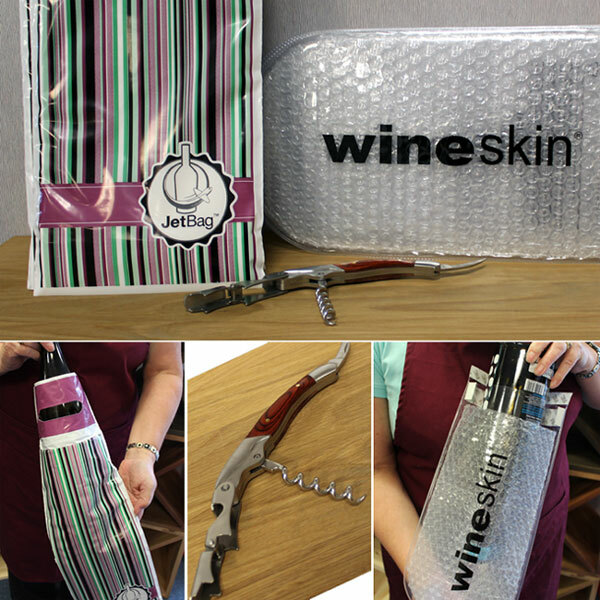 WineSkin & JetBag Wine Bottle protection bags and a handy double lever Wineware corkscrew…perfectly timed before you head off on your summer holiday. Our popular wine bottle protection bags are great if you’re taking Wine on holiday with you or you’re bringing Wine back, simply store the bottle (& the bag!) within your packed luggage and it’ll travel back in one piece! 5 WineSkin’s and 5 JetBags are included in the Wineware Summer Competition, along with our trusted double lever Wineware Corkscrew which is always helpful! It’s easy! To be in with the chance of winning our fantastic prizes, simply like us on Facebook, follow us on Twitter, Tweet us, add Wineware to your Google circle, leave a comment on the blog or all of the above! The Wineware Summer Competition ends on 30/06/2014…so entry now to be in with a chance! I’d like to win as I love wine and travelling with it too! I’d love to win as I often fly to France to visit my daughter and it would be rude to visit France and not pick up a few bottles to bring home. I love travelling and I love wine so this is perfect for me ! Handy for travelling in the caravan. It would just be so handy for impromptu get togethers. What an excellent prize, I feel a picnic coming on….. I would love having to stop and think about travel (and breakages!) if I wanted to bring some wine on a trip, or buy. One less thing to worry about and more time to enjoy (the wine)! Useful for transporting wine safely. It’d be great for picnics and camping trips! I’m always scared of bringing home wine in my suitcase, this would solve that problem, and the corkscrew is a bonus! I’d like to win because we enjoy alfresco eating and this would be perfect for our jaunts. Looks nice and handy for those day trips! Almost obligatory when holidaying in France – great idea thanks. My Dad is very fond of good wine so I would like to win this for him! Mmm I like sampling locally made wines from wherever possible so this would be perfect for bringing it home. Great giveaway! Great for bringing back wine from holiday and we do a lot of that! I love my wine so it would be very useful, especially on picnics or bbqs on the beach! We’re going to France in August and will definitely be bringing some wine back with us – this would help keep it intact in our luggage ! I’d like to win it for my mum, as she does enjoy the odd drop of wine! Would come in handy for those barbecues and weekends away. Will be very useful for an upcoming picnic in the park I am going to. It may be taking the wine for a picnic in the park with friends, or bringing home that special bottle of wine from Italy, this would be the ideal way to make sure it gets there safely. We go and stay with friends & family a lot and always take a bottle or two with us. This would be so helpful! I’d love to win for my mum, she enjoys a glass of win of an evening. I want something better to wrap my wine in than a used T-shirt! I would love to win so we can wine where ever we go and bring some back too! A really handy bundle of accessories for a wine lover & her husband! With relatives in France to Visit we always come back with great wine. Would be fantastic not to worry about the bottles smashing in the hold. I always worry about bringing wine back from holiday so try and persuade my husband not to – this would definitely help ease my worry. what better way to start a holiday! !